Abria can also be spelled Abreya, as in Abreya Oda, one of Abria Pregnancy Resources’ clients, who came into the clinic on Dec. 28 carrying a box of donations. She came with her mother, Donna Oda, and her one-year-old son, Brayden, to share her blessings. Oda had first visited the clinic in Jan. 2016 unsure of her next steps. Her birth control had failed, and she was pregnant. Shocked by the positive result on the home pregnancy test, she first went to Planned Parenthood for confirmation. Leaving there, she saw a sign for Abria Pregnancy Resources, but at that moment the last thing she wanted was a reminder of her pregnancy. A few days later, though, the thought of the pregnancy resource center with her own name came back to her, so she looked up Abria Pregnancy Resources online and made an appointment. “They showed me that you have options. Even though [the pregnancy] wasn’t planned, it’s not the end of the world. You can still do what you want,” she said. As the birth of her son approached, Oda enrolled in parenting classes and also met with Abria’s counselor, Laura Houlton. The support came at a critical time in her pregnancy. Her spirits were low as she wondered what life would be like with a child in tow, compounded by the lack of support from her son’s father. In Abria U, she prepared for Brayden’s birth and earned a car seat, the last item she needed to care for him. She also found a new vision for the possibilities of her life as a mother. Since Brayden’s birth in Oct. 2016, Oda has gone far. She earned her Medical Administrative Assistant certificate and is currently pursuing further education in medical coding at Century College. On the go with her little one, she still uses the convertible car seat she earned at Abria. She was not the only one in her family blessed with new life recently. Two of her cousins also gave birth to sons in the last year. In gratitude for the healthy babies, the Oda’s and their extended family decided to direct their annual Christmas donation to Abria. As a family tradition, the adults purchase gifts for a charity instead of for each other. 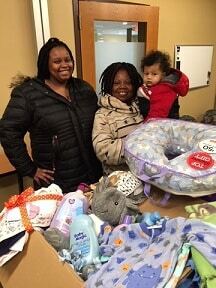 Five families contributed to the large donation of newborn necessities. 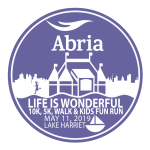 “What a joy it was for us to see Abreya a year-and-half later wanting to help other women out of her gratitude,” Naughton, education program manager, said.